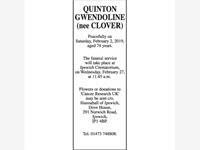 QUINTON GWENDOLINE (nee CLOVER) Peacefully on Saturday, February 2, 2019, aged 74 years. 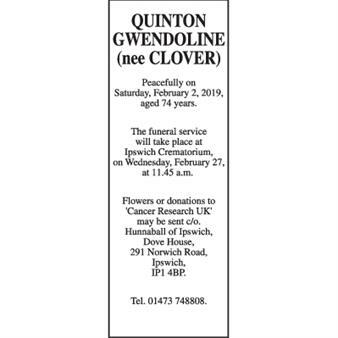 The funeral service will take place at Ipswich Crematorium, on Wednesday, February 27, at 11.45 a.m. Flowers or donations to 'Cancer Research UK' may be sent c/o. Hunnaball of Ipswich, Dove House, 291 Norwich Road, Ipswich, IP1 4BP. Tel. 01473 748808.